«Etno Dvaras» is located in the heart of Druskininkai in a quiet, scenic spot on the shore of lake Druskonis. 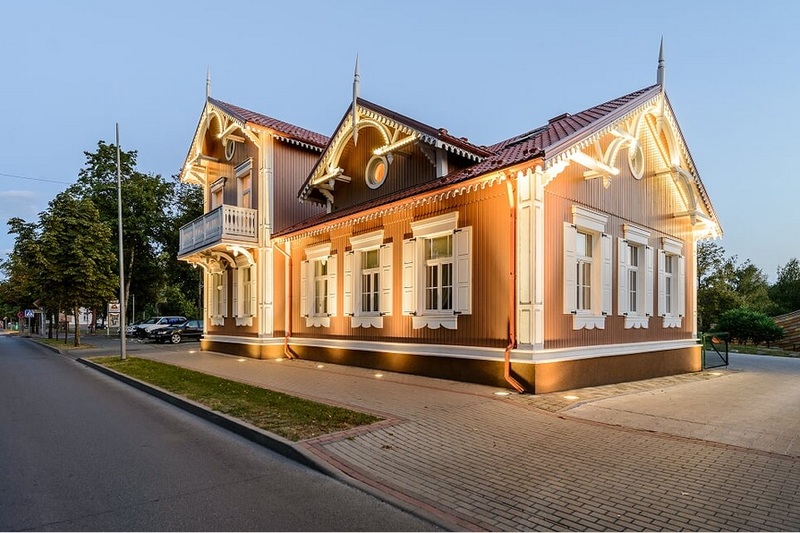 In the cosy atmosphere of the fine old Lithuanian manor house decorated with natural wood, antique art and reproductions of drawings from authentic books you can gaze at the splendid view of the lake while listening to Lithuanian music. The restaurant has 4 halls (accommodating from 20 to 200 guests) for banquets, buffets, parties, festivities. Folklore evenings are organized for tourist groups. 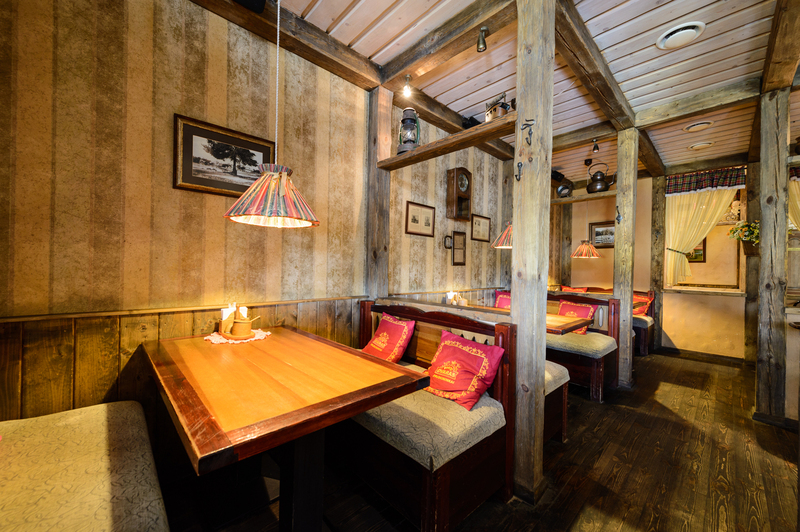 We invite you to enjoy Lithuanian cuisine that is certified for authenticity by Lithuania's Culinary Heritage Fund and to taste dishes that are characteristic of Lithuania's mainethnographic regions. We offer up to 12 types of didžkukuliai or zeppelins, various salads, soups, appetizers, meat (pork or beef), fish dishes and desserts. Also we offer to taste unpasteurized, unfiltered light, dark and wheat types of beer "Druskininku Dvaro Alus" produced in our own brewery. This naturally fermented and “live” Lager beer characterized by a “light” taste and light amber colour is fermented with a bottom-cropping yeast. Exclusive varieties of aromatic hops and high-quality malts impart it with a special taste and aroma. This beer pairs well with fresh meat, spicy courses, light snacks and salads. This naturally fermented and “live” ALE beer characterized by a dark colour and “solid” taste is fermented with a top-cropping yeast. Selected caramel malts, exclusive varieties of aromatic and bitter hops impart it with a special taste and aroma. This beer pairs well with game meat, dark meat, hard cheese and blue cheese. This naturally fermented and “live” Ale beer characterized by a light colour and exceptional aroma is fermented with a top-cropping yeast. Exclusive varieties of malts, noble aromatic hops and the tones of orange and coriander impart it with a unique taste and light fruity aroma. This light ALE beer pairs well with fish and seafood, cheese and desserts. The city beach is just nearby. Cosy and stylish Villa „Arnika“ is established with the idea to protect historical and cultural heritage. It offers 7 standard rooms and can accommodate 14 guests (up to 17 guests with extra sleeping armchairs for children are added). Artistically arranged rooms include large-sized beds with soft mattresses, writing tables and wardrobes, flat screen TVs and bathrooms with shower and complimentary toiletries. Two rooms on the top floor also feature spacious balconies. Five commodious and convenient rooms will let you experience homelike cosiness and warmth inflamed by their atmosphere and interior. Every single room is designed to make your relaxation pleasing and comfortable. Attention: your reservation is valid only after you receive confirmation.